Chateau Haut-Sarpe is one of the oldest wine estates in Saint-Émilion. The chateau itself was modeled on the Petit Trianon at Versailles, otherwise known as Marie Antoinette’s cottage, and is set among vineyards and gardens. Living in Bordeaux, I can taste most of the regions wines at the various wine bars in the city. So my motivation for selecting Chateau Haut-Sarpe to visit is it’s spectacular setting on the highest hill in Saint-Émilion. 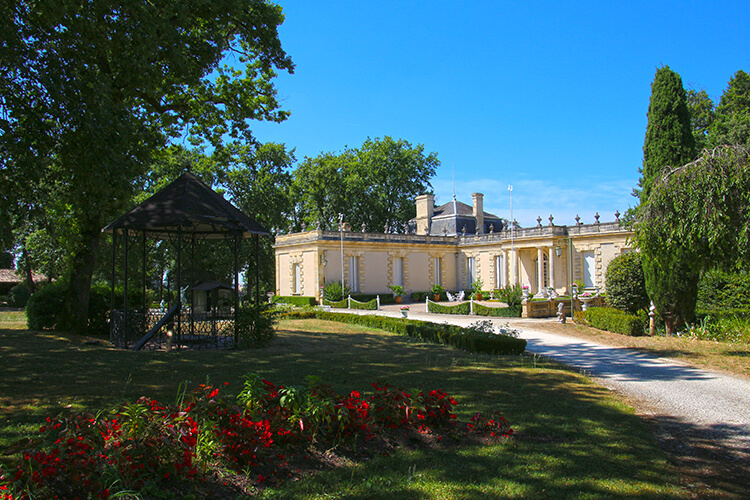 The wine estate was started in 1750 and exhibited its’ wines in 1867 at the International Exhibition in Paris. Though the chateau was purchased by the Janoueix family in 1934, the wine has been made there for over two centuries. I couldn’t wait to taste it. Sometimes touring wineries is an almost torturous affair with the smells of the barrel room and sight of plump grapes on the vine making you practically itch in anticipation of that first sip you’ll no doubt be rewarded with at the end of the tour. But visiting Chateau Haut-Sarpe is truly a pleasure from beginning to end. Wine isn’t the only attraction at Chateau Haut-Sarpe. It’s impossible not to take notice of the sculptures and charming buildings that make up a tiny village. 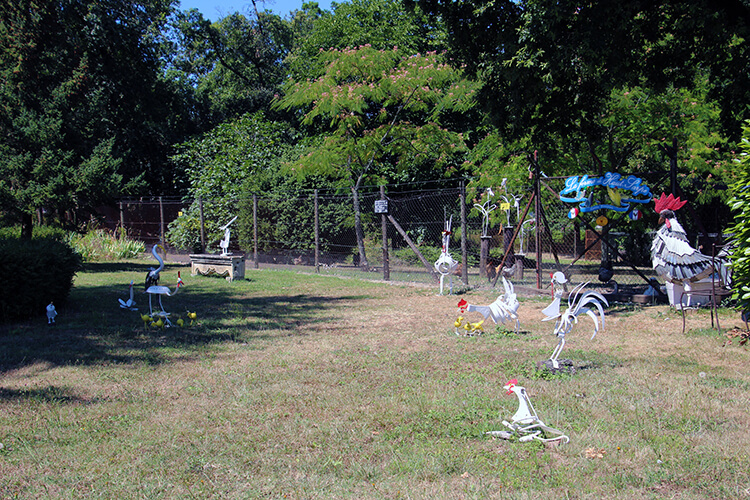 The sculptures and gardens are meant for visitors to enjoy as you wander the estate’s grounds. Chateau Haut-Sarpe even has an emu! Don’t be fooled by the roosters crowing. Head over to check out the aviary where there’s also a number of exotic birds, including emus, residing along with the roosters. Why are they there? Simply because the owner really loves birds, which was further evidenced with her collection of owls and ducks inside the main house. My favorite part of the village was the seemingly cute and innocent pub, which inside is anything but. An unexpected Coyote Ugly style bar where neck ties are cut off and hung from the rafters, I imagine it would be just as daring to order a glass of water in here as it was in the movie. Clearly, this is the place to be during the harvest and wild sombrero-wearing grape pickers get up to some shenanigans. The barrel room is one of the prettiest I’ve seen with gorgeous stained glass casting an array of soft rainbow colors on the oak. Another surprise was the collection of antique cars, which I know for a fact still run since we fired up their engines. I could totally see myself putting around Saint-Émilion’s narrow roads in one. We made one last stop as we made our way to a small area of the garden, where we’d be enjoying a glass of the Saint-Émilion Grand Cru Classé. Long before Saint-Émilion’s hillsides were dotted with Merlot and Cabernet Sauvignon, they were fields of grains. A handful of the ancient windmills that were used to grind the grains, including one you can peek inside at Chateau Haut-Sarpe. Of course, no tour of a wine chateau ends without tasting the fruits of their labor and we were left to enjoy a glass of Chateau Haut-Sarpe’s Saint-Émilion Grand Cru Classé. Though you can’t buy a bottle to take home directly at the chateau, you can find it at the Maison du Vin (a sort of visitor center/museum/shop) in the center of Saint-Émilion. It’s also worth noting that Chateau Haut-Sarpe has a bed & breakfast with guest rooms with private bathrooms and vineyard views called Chateau Jean-Francois Janoueix for around €130 per night. Though we haven’t stayed at the property (yet), we’d most definitely like to wake-up to those views! 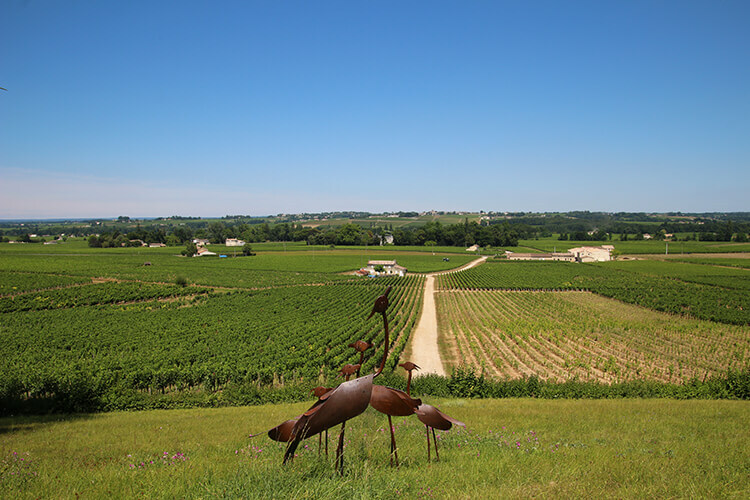 Chateau Haut-Sarpe is located 1.7 kilometers from the center of Saint-Émilion and can be reached by a 20 minute walk or by hiring a tuk tuk or a bike from the Saint-Émilion Tourist Office. You can reach Saint-Émilion from Bordeaux easily on Oui SNCF trains in about 30 minutes. Note that currently visits are only in French and Chateau Haut-Sarpe only occasionally accepts individual requests for visits. Email to make an appointment. The visit and tasting is €8 per person. 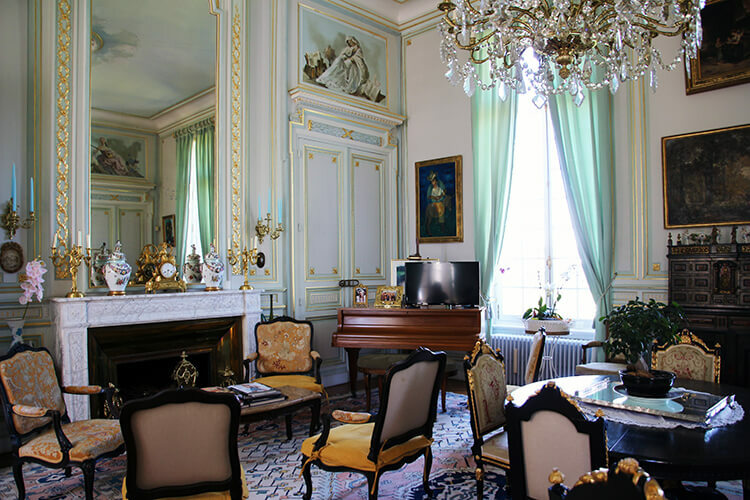 You can also book their B&B Chateau Jean-Francois Janoueix for around €130 per night. This article contains affiliate links. When you book on Booking.com or Oui SNCF through our affiliate sites, we earn a small commission at no additional cost to you. Saint-Émilion is so fantastic. Hope you make it there for a visit soon, Tandy! These photos are breathtaking! I feel like I escaped from the comfort of my home! I need to really explore that area in depth. 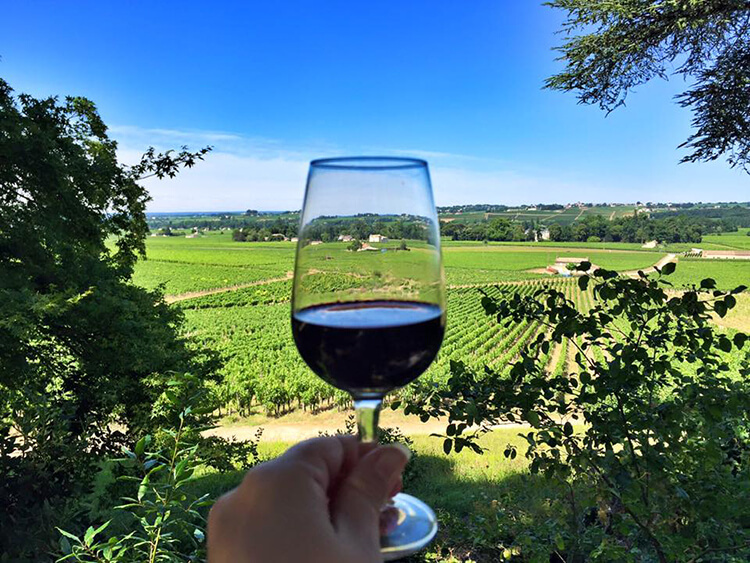 I loved Bordeaux (was there exactly one year ago today) and simply didn’t have enough time. The chateau is now on my list! With nearly 10,000 different wine chateaux in the region there’s always more to explore. Hope you make it back for another visit, Christina! The sculptures really make it unique! All the estates are gorgeous, but many look so similar. We are planning a trip to France in March and you’ve just changed my entire itinerary! I NEED to go here. Let’s now go convince the Husband. Thanks for sharing this! Let me know if you come to Bordeaux, Marnely! It should be beautiful in March with all the spring flowers and trees blooming.